Apex is SRAM’s new budget groupset that offers something special with its super-wide range of gears. We ride two Apex-equipped bikes from famous names Condor and Dolan. SRAM only recently arrived at the top table of the ‘big three’ road component manufacturers, but in its five years of big three-dom most people would agree that the American company has brought to that table more than rivals Shimano and Campagnolo. Probably what gained SRAM entry to the exclusive club — apart from having the capacity to mass produce — was its ability to innovate. Its DoubleTap shifters used only one lever to change up or down the cassette, where everybody before had used two. The top pro-level SRAM groupset, Red, knocked Shimano Dura-Ace off its perch at the top of the lightness tree. And now SRAM is aiming at the budget end of the market with the launch of Apex last year. Normally a cheaper groupset, although its maker’s spiel always informs us that it ‘benefits from the trickle-down technology of the top models’, is made of heavier materials, wears out quicker and doesn’t look as cool. Apex unavoidably is all those things, but it goes where no budget groupset has gone before: it actually offers something new to the less serious rider that the top groupsets don’t. Recognising that sportive or leisure riders need smaller gears for steep hills and that there’s a better way to achieve them than with the unwieldy triple chainset, SRAM has reworked the compact chainset using a system already successful in its mountain bike components to give the Apex 10-speed cassette a spread of gears from 11 to 32 teeth. It sounds like something obvious, but with 50/34 at the front, Apex is the first road groupset to offer these ratios. It’s called ‘WiFLi’ – wider, faster, lighter (than a triple). SRAM makes no secret of the fact that Apex is intended to kill off the Shimano triple frequently specced on entry-level road bikes. Apex only really arrived in time for winter, so we’ve got bikes set up for the dark months, equipped with mudguards. Although we haven’t had them for long enough to see how well Apex wears when road grit starts working on it like sandpaper, we can give you our first impressions. There’s something of a north-south divide in this test. The Condor Italia is from the London firm that recently celebrated its 60th anniversary and has a huge reputation for quality and style. The Dolan Preffisio bears the name of Ormskirk, Lancs-based Terry Dolan, the frame builder who specialises in track racing bikes. He has supplied bikes to Olympic, world and national champions and if you watch any track cycling on TV the velodrome is full of bikes with Dolan painted on their down tubes. 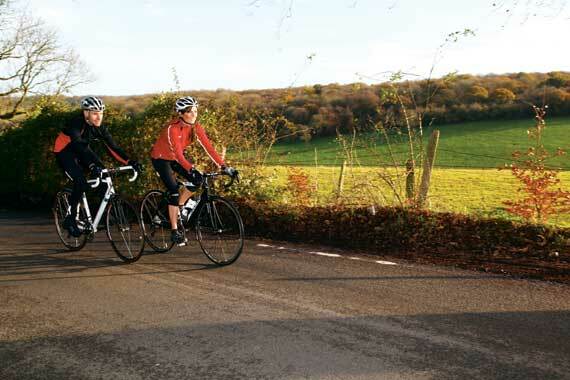 This article first appeared in the January 2011 issue of Cycling Active magazine.